Kitchener-Waterloo eagerly awaits the completion of the ION Light Rail Transit system that will consist of 19 stations across Kitchener-Waterloo. At nine stops and designated areas along the ION route, custom artworks will be installed as part of the ION Public Art Project, commissioned by the region of Kitchener-Waterloo. These works depict a broad range of artistry styles and all represent Kitchener-Waterloo differently as an expanding, diverse and bountiful area through various mediums. The artists were commissioned through a two-stage jury selection process that was completed in February of 2017. The community of KW, being an essential part of the process, was involved through workshops, surveys and a stakeholders group. Lilly Otasevic and Brandon Vickerd were two of the artists who have been selected to create and display artworks for the project. Otasevic’s piece, “Fabric of Place,” has been arranged to be installed at the Albert McCormick pedestrian crossing as a barrier enhancement, located in the community of Lakeshore Village closest to the Northfield ION Station. “I was mostly inspired by the Mennonite community and nearby St. Jacob’s community,” Otasevic said. “Fabric of Place” is an interactive sculpture that seeks to facilitate community engagement and was placed at a pedestrian crossing for this purpose. It consists of several panels which can be rotated and moved by passers-by to shift and create new patterns. Purposefully, “It reflects that the community is evolving and restructuring … nothing is permanent,” Otasevic added. “We organized two workshops where I had the opportunity to meet the representatives of the community,” Otasevic said. “First I presented my idea and they presented theirs back with suggestions, they brought fabrics from their different cultures and countries where I was able to see the colours and patterns,” Otasevic said. 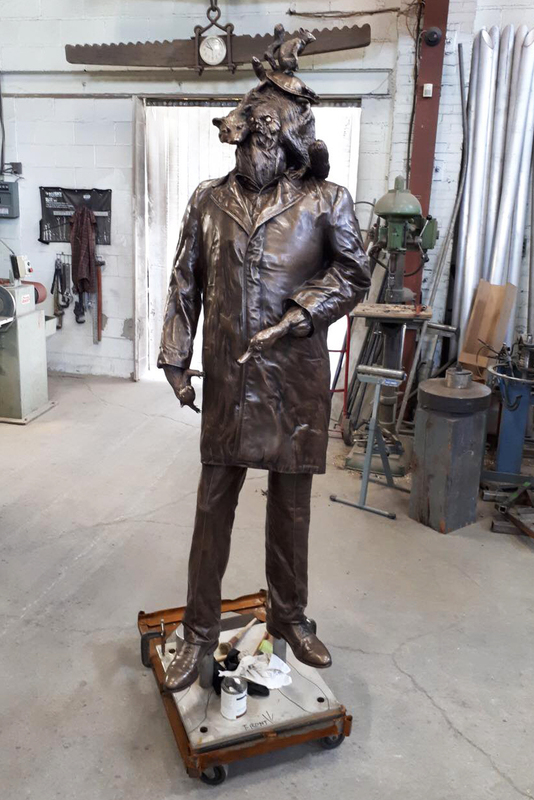 Vickerd’s piece, “The Passenger,” will be located at the Research and Technology Stop, just North of the University of Waterloo and walking distance from the Accelerator Centre. “It’s essentially a single bronze figure that from a distance appears to be a commuter waiting for a train, but as you get closer to it you begin to realize that its head and its hands are actually composed of animals,” Vickerd said. “The Passenger” represents interconnectivity with our wildlife and environment, specifically within our transit systems. “The piece really talks about how we perceive animals and nature to be somewhere removed from the city, when, in fact, a lot of these animals share the urban landscape with us,” Vickerd said. All of the artworks scheduled to be installed surrounding the ION LRT have been shared on the Region of Waterloo website where you can look further into the stories behind them and check out the artists who have created them. Although no dates have been finalized regarding the installation and unveiling of the artworks, it is suspected to be at some point before spring 2019.